Our experienced rehabilitation team is committed to providing outstanding results and excellent quality of care. Residents are empowered through individualized programs to reach goals of increased independence and ability. 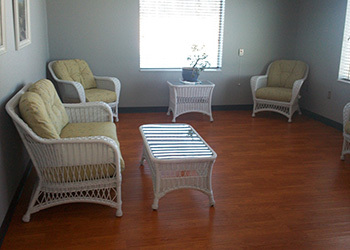 Resident families are also encouraged to participate in therapy sessions, caregiver education, and training. Our physical therapy team works toward specific goals of achieving the resident’s highest functional level of independence. Physical therapy focuses on identification and rehabilitation of individuals with physical impairment and pain, as well as future injury prevention. Following evaluation, our experienced physical therapists develop an individualized treatment program. The goal is to achieve safety in a variety of areas. Our professional occupational therapists use task-directed activities in the treatment of our residents whose functional abilities, daily activities and independence have been impaired by illness, injury or aging. Occupational therapy assists our residents in adapting to their social and physical environment by mastering tasks essential for daily living. Our occupational therapists may work with residents who have debilitating arthritic conditions or those with difficulty bathing, dressing and other activities of daily living. They assist residents with impaired vision and/or hearing to function well in their environment. Our speech therapists provide a range of interventions to assess and help restore abilities in the areas of communication, swallowing and cognition. Treatment programs are designed to help residents affected by stroke, brain injury, dementia, and other neurological disorders. Our professionals also work with residents suffering from hearing impairment, respiratory illnesses, and complex medical conditions.